I admit to being slightly disappointed with this book. I was expecting a little bit more romance and I honestly didn't really grow to like Knox until the last few chapters. I just felt like Knox was slightly jerky (being the better word) and I never really understood the love both him and Felicia felt for one another. We are repeatedly told that they both love each other but why? I felt that Knox never really even got to know Felicia and the type of person she was. I get that they are soul mates but that shouldn't necessarily mean that you love someone. I need to be shown why and I just don't think that was done well. I really did enjoy the world that Virna created. It seemed very realistic and believable. 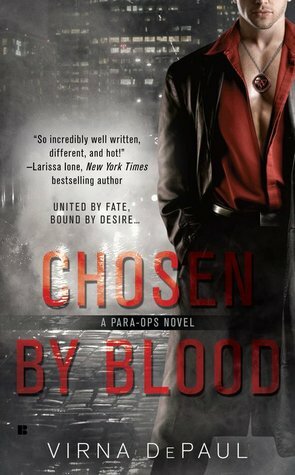 I also loved reading about the Para-Ops team. I found all of the characters extremely interesting and I can't wait to see how they develop even more in future books. I especially love the tension between Wraith and O'Flare. I can't wait to read O'Flare's book. Lord Falconridge is a member of the Inferno Club which to the public seems like a club for debauchery and shenanigans but is actually a cover for the Order whose members are spies sworn to protect the King of England and their country from the Promethean's. When Jordan, Lord Falcolnridge is just twenty two he meets and falls in love with Mara. For Jordan this is a difficult time because he is about to be sent off on his first mission for the Order. So he leaves and never writes to Mara fearing that his letters might somehow endanger her with his enemies. He returns one year later to find Mara married to another man. Flash forward twelve years, Jordan has just returned to London to work on a case for the Order. While at an auction Jordan and Mara run into each other. Both experience strong feelings of anger towards the other. Jordan is still angry that she didn't wait for him and has held a torch for her for the twelve years he's been gone. While Mara has never quite gotten over Jordan and doesn't understand how he could have left and never wrote her. She is also mad at herself because she had a disastrous marriage and the only good thing that came from it is her son Thomas and her close friendship with the Prince Regent. Eventually Jordan and Mara become lovers. Both have always carried strong feelings for the other and they just don't want to be apart anymore. The only problem with this is that Mara never fully trust Jordan because she senses that he is hiding something from him. Jordan, is hiding secrets from Mara but it's because he is in the Order. He doesn't want her harmed for knowing too much. I really had a hard time finishing this book. There were a few times I put it down not wanting to pick it up again. The only reason I did is because I really wanted to know what was going to happen with Drake who was a secondary character. I felt that the romance in this book was overshadowed by the spying. It just seemed as if the romance was an afterthought. I never really felt Jordan and Mara connect. We the readers are repeatedly told that they both love eachother but never are we shown how it came to be. As for Mara, I never really grew to like her. She just seemed so selfish and everything was about her. I never really felt her love for Jordan. I had such high hopes for this book. I am a sucker for second chance loves stories so when I saw that this book had one I was very eager to read it. I was very disappointed. I honestly did not even care what happened with Falconridge and Mara.